Forget video games! In Adventure Quest, the children and teens become the heroes of an incredibly fun and dynamic quest, working together in a mythical and magical world to overcome interesting challenges, solve mystifying riddles, brainstorm unique solutions to puzzling dilemmas, and swashbuckle with foes. The campers experience the excitement and confidence that comes from banding together to defend their village, solve a perplexing mystery, or negotiate a peace treaty. 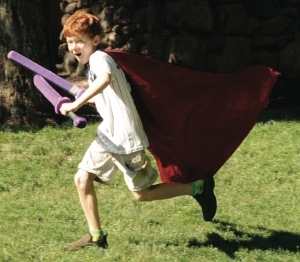 Wielding safe foam Swasher swords, the campers play dueling games and act out challenges like fending off a bullying ogre or a thieving band of pirates, in an environment that teaches good sportsmanship, fair-play, and respect for others. Then they exercise their minds as they try to piece together the clues in a coded riddle and follow a map to buried treasure. Our Adventure Quest program springs to life in our week-long Summer Quests. Each week of camp is a unique “Quest” – an interactive story that engages the campers’ imaginations while teaching them the fundamental principles of responsible empowerment, creative problem-solving, and cooperative conflict resolution. Campers end the week feeling empowered, excited, and full of stories to tell. Dates: 2 weeks of day camp: Aug 19-23 & Aug 26-30. Star Quest is a science fiction live-action roleplaying game similar in many ways to Adventure Quest… the Questers band together in small groups of like age to discover strange new worlds, overcome dynamic challenges, negotiate intergalactic treaties, and battle using blasters (NERF guns) and fusion blades (foam swords). The themes and settings explore futuristic mainstays like warp speed, mech suits, tapping into the “Meta” for telepathic powers, time travel, cyberpunk netrunning, alien “hive mind” sentience, and more. 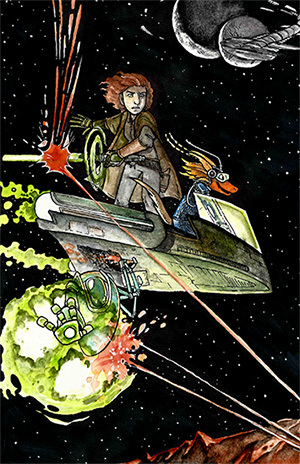 Join us for an exciting, active, and mind-bending programs that are a short ways off, in a galaxy really, really close. The most perilous missions. The most epic stories. The greatest rewards. Some questers have been going on quests for years and are ready for the next level of challenge. 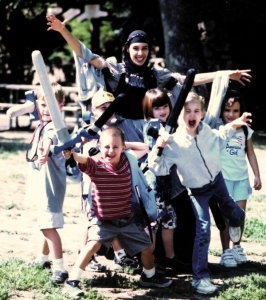 Power Quest is an Adventure Quest program for highly-experienced questers, with the opportunity to face challenges that would be too daunting and difficult for questers of less experience. In these adventures, the Questers encounter legendary villains, make complex ethical decisions, learn from the consequences of their actions, and have the opportunity to earn greater rewards. By their actions, they may change the course of history in Thael. Creative, fun, after-school activities in Bellingham! We will be offering Adventure Quest After-school enrichment programs in the Spring of 2019! Read testimonials about our programs by parents and educators. Let Majestic Adventures bring an exciting and magical experience to your birthday celebration, block party, family get-together or corporate team building event! 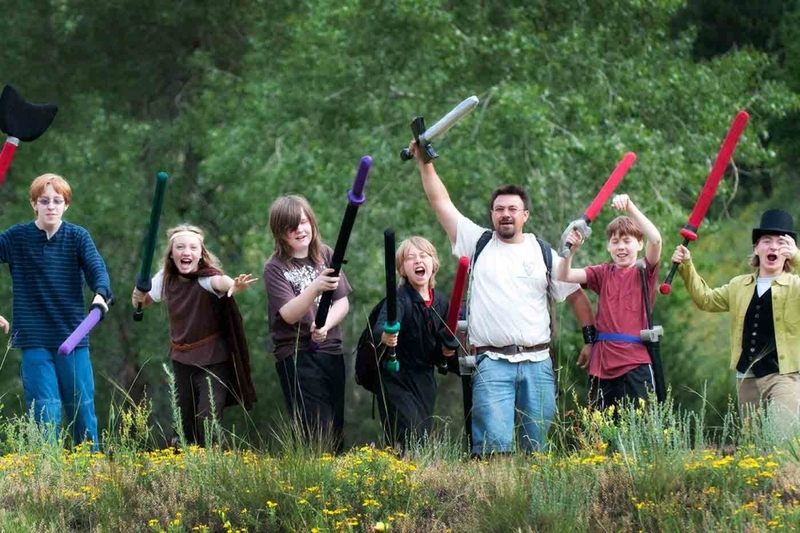 We offer a wide range of popular birthday and special events programs including storytelling, imaginative and engaging Adventure Quests, exciting sword games, and treasure hunts! You choose your location and we come in costume with Swasher™ swords for everyone. All of our events are customizable for children and adults alike. Contact us today to arrange your party or event. Click to view our program calendar showing the dates and details of all our scheduled programs.